Hi Friends: It's time for Father's Day cards again! My card was created for 2 challenges - Father's Day and One Layer Cards, so it's a single layer (always a challenge for me!) I stamped the below Stampin' Up! 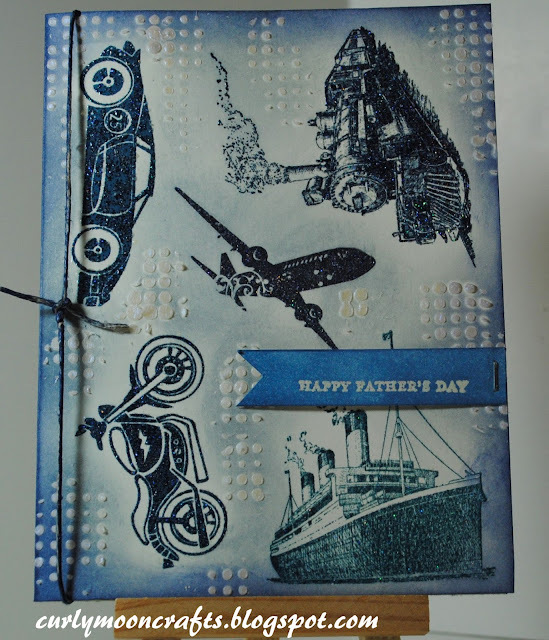 stamps and inks, and embossed them with a clear glitter embossing powder on Very Vanilla cardstock. Then I applied some CM Iridescent texture paste through the Tim Holtz Dot Fades layering stencil. I used Distress Inks to color parts of the background. I stamped the sentiment onto a strip of cream cardstock with Versamark ink, embossed it with the clear embossing powder, then colored it with Distress Ink and stapled it to the card. I finished it off with jute colored with Distress Stain. Thanks for taking a peek! Have a great day! this is a great guy card! I love the vintage feel :) thank you for playing along with us at simon says stamp wednesday challenge!! Patti this is a wonderful masculine design and I adore the transport theme.